The great success obtained by Modular Sterility Testing Isolator and Automatic Glove Tester on the market in recent years has led Comecer to introduce two important upgrades, strongly recommended by the customers, in order to improve and implement these product segments. The first upgrade involves the Modular Sterility Testing Isolator (MSTI), whose reliability as an optimal and versatile solution for the sterility test has been a matter of fact since many years. MSTI has been designed for decontamination by means of Hydrogen Peroxide Vapours (VPHP); up to now, it was connected to the generators of this decontaminating gas placed outside the machine. This type of configuration had some pros ie, the possibility of using an existing generator to decontaminate several environments, such as the isolator, but also some cons ie, the more complex operation (moving the generator from lab to lab, connection, connection verification, etc.) and higher risks (the operator must select the exact decontamination program). This double-sided coin, increasingly lacking in terms of human risk factor reduction, has resulted in the widespread request of this product as an All-In-One. Comecer has immediately answered to this request by offering its costumers a hydrogen peroxide vapour decontamination system, tailor-made for the MSTI machine and fully integrated in it. This way, the overall system contains two cores, isolator and generator, perfectly aligned in terms of design, components and control, thereby making it easier to clean externally, facilitating maintenance, and allowing for a single control system. This system configuration, which allows maintaining its modular structure, making it highly configurable, is having a huge success on both the domestic and international market, thereby proving the excellent technical and economic results. The second upgrade is related to the introduction of a new system for glove integrity testing. The demand for higher safety and contamination control in handling operations performed inside isolators has generated an increase in the frequency and necessity to perform this kind of testing. 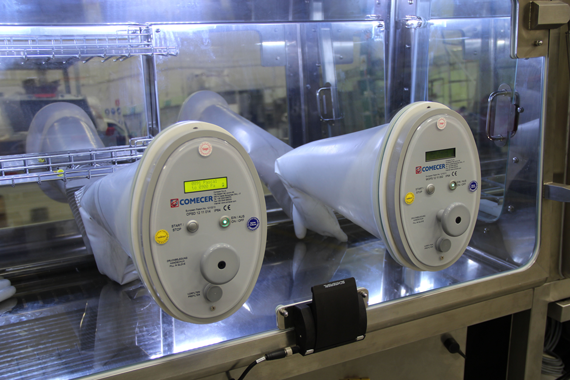 For this reason Comecer has developed a new testing system, the Glove Integrity Testing System (GITS), and is now prepared to launch this innovative technology for glove integrity testing, one of the most critical procedures for the safe and correct use of isolator systems. The GITS consists of a special flange that is connected to the glove port. A dedicate software installed in a remote PC recognizes and communicates directly with the flange via Wi-Fi in order to start, control and register the entire testing process. In the end, the software produces a detailed report showing the date, time, reference id of the glove tested, and a graphical representation of the pressure variation inside the glove (pressure decay method) and the final result. It is easy to understand that the GITS represents a quick, safe, and effective method to test pharma gloves. The GITS eliminates the inconvenient use of long cables, tubes, and the transportation issues associated with the use of traditional glove testing systems within a typical laboratory or production suite.